WHY OUR ELECTION SYSTEM IS FLAWED AND (ALMOST) EVERYONE SHOULD VOTE STRATEGICALLY FOR SANDERS, EVEN IF THEY LIKE SOMEONE ELSE BETTER! This is America and we very much can waste our vote in more ways than one! The easiest: not vote at all. Many people are under the impression that if their state consistently goes red or blue that they don’t need to vote in the primary. THIS IS NOT TRUE! Democratic primaries are not winner take all, so even if your state sends a small amount of delegates for your candidate it is crucial to their campaign. This is true for Democratic voters in red states as well. Many other people don’t vote because the whole thing is rigged so it won’t make a difference anyways. Doing nothing guarantees that you won’t make a difference, or worse, not voting is actually a vote for Trump and Clinton! Social media and the internet have changed politics completely. This isn’t the same game it was 10 years ago! Go vote! If you are planning to vote and you’re a Republican, all the more reason to vote in the primary also and get your friends to do the same. I’ll explain: If you support Trump because you are strongly opposed to Clinton then you might as well change your voters registration to Democrat so you can vote for Sanders. Bernie has a better chance of beating Hillary than Trump does and he needs your help to make it to November! Trump is looking like more of a shoo in for November so you might as well vote Sanders now as a vote against Hillary and you can always still vote for Trump in November regardless what party you’re registered under. If you really like Cruz or Kasich go for it, but odds are you’ll be throwing away your vote since the remaining Republican primaries are winner takes all. Bummer, but better Bernie than Trump right? If you really like a third party candidate, sorry, it’s too late to vote for them without throwing out your vote. Remember that time when Nadar voters could have defeated Bush if they’d voted for Gore? That was Ironic! If you don’t want that to happen again, vote for Sanders, get involved in election reform, and fight for run-off ballots like Australia uses! Run-off voting is the only way 3rd party candidates will ever stand a chance and Sanders is the only presidential candidate that has actively supported them. There’s a huge bi-partisan effort underway already for run-off ballots and a vote for Sanders is a vote for election reform. 1. Maybe you’ll be able to vote your conscience next time! After you’ve voted in the primary you can change your registration back to your real party which helps them get some funding. If you are voting for Clinton in part because you believe she can beat Trump, think again. Sanders seems to have better odds of that.2,3 Here’s why: Clinton supporters would mostly support Sanders in a general election but not vice versa! Sanders has huge support among young people and Green voters who wouldn’t vote for anyone but him. He also has huge Independent and Libertarian leaning Republican voters that Trump is alienating. You can always vote Sanders in the Primary just in case and then vote Clinton in November if she wins anyway. It is crucial that this election not end up Trump vs. Clinton! Tons of people are coming out and saying that they hate Clinton but would vote for her in a general election just to defeat Trump. Tons of other people are coming out and saying that they hate Trump but would vote for him in a general election just to defeat Clinton! If that were to happen the whole election would go totally screwy with people voting all sorts of strategic nonsense they don’t actually want or throwing away their votes on candidates that don’t stand a chance and the results will not represent our country at all. Guaranteed! To learn more about a better voting system that America desperately needs to adopt, click this link and read the rest of the comic that the image above is from! Australia is doing this all much better than we are and so are many other countries, states and counties! 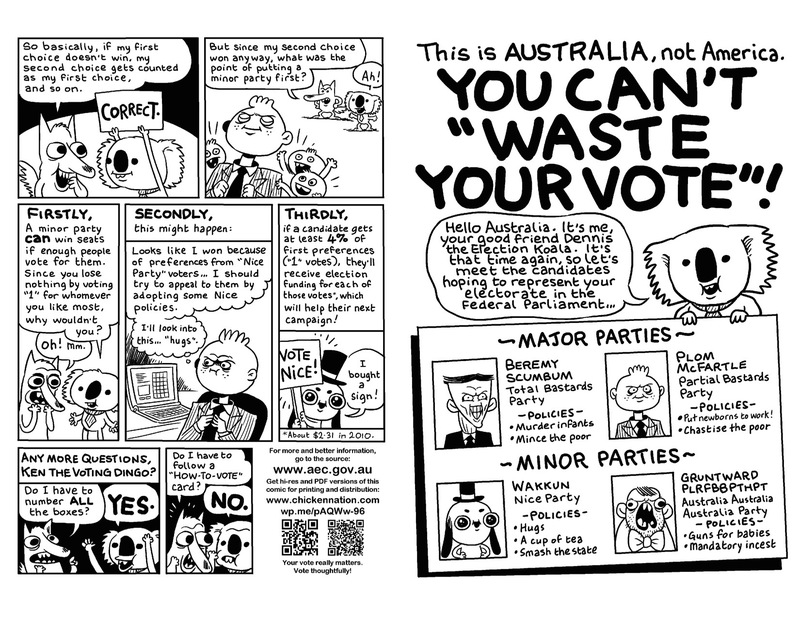 With preferential voting everyone only has to go vote once and they can vote their conscience. Simple. Their system undoes the 2 party monopoly and allows political parties to form around many issues, because our world is not actually black and white… or red and blue. note: preferential voting is also known as instant run-off voting or ranked ballot voting. remember: to vote for Sanders in most states you have to register Democrat in advance, specific cut off dates vary by state but it’s quick and easy to change your registration online! WHY OUR ELECTION SYSTEM IS FLAWED AND ALMOST EVERYONE SHOULD VOTE STRATEGICALLY FOR SANDERS, EVEN IF THEY LIKE SOMEONE ELSE BETTER!